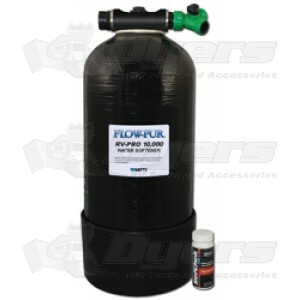 Flow-Pur’s RV-PRO 10,000 is the most user friendly, competitively priced RV softener on the market today! Features a built-in drain line flow restrictor that provides more effective regeneration, increasing capacity by up to 55%. Custom designed flow valve allows regeneration without having to connect or disconnect from the system. PLEASE NOTE: Your resin only needs to be replaced if it is accidentally dumped out or damaged. Other than that, your resin should last for many years. After spending the last winter in the Lake Havasu, AZ area with the very hard water there we knew we had to do something. Already the valve on our dishwasher had gone bad and was leaking with hard water deposits. I looked at several RV water softeners and decided on this one for both price and capacity. The hook up was easy and it works great. From our current use it appears I'll need to recharge it about every 2 weeks and I'm pleased with that. Recharging took about 30 minutes. Having soft water is such a treat now. This unit did what I wanted it to do. Easy to install and service. Bought for $197 on sale so price was right..
Easy to setup and well made.I fill my rv from the well at my house so I know the water is terrible. After filling the tank I used a test strip that they supply to check the hardness.I also checked the water straight from the well. Needless to say it really softened the water so now I don"t worry about my plumbing.